You want to eat potato chips and look good doing it, don’cha? Sure you do. And if not, the above potato chip maker/edible crown arrangement also makes fruit crisps. 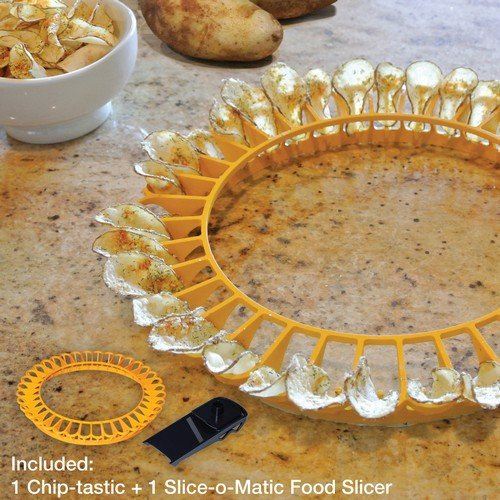 Just use the included slice-O-matic and pop the Ronco Chip-Tastic Microwave Potato Chip Maker into the microwave. Your great fashion sense will reward your waistline. Plus, since walking around with a crown of potato chips on your head is sure to become a new fad, people will look at you like a fashion icon. Or at least look at you.